remaining of Fe. Although their magnetic strength is lower than rare-earth magnets, they are the strongest magnets before the invention of rare earth magnets. At present, Alnico magnets are excellent choice for high-temperature or corrosion-prone applications. Our company (CMS & Magnets For Sale) carrier different grades (alnico 5, alnico 7 etc. ), shapes (disc and block), and sizes of Alnico magnets to optimize their magnetic performance, operational temperature and cost. Alnico magnets have a high Residual induction or Remanence (Br) but relatively lower Coercive Force, which means they are capable of possessing a large magnetic strength, but more easily self-demagnetized when the external magnetic field is removed. Thus special care must be taken to prevent demagnetization of Alnico magnets by a nearby repulsive magnet or electrical current once they are magnetized. On the plus side, partially demagnetized Alnico magnets can be easily re-magnetized. Taking advantage of this property, Alnico magnet can be efficiently utilized by magnetizing it after the magnet is assembled in a final magnetic circuit. Alnico magnets have a very high Currier temperature (799/1470 ºC/ºF) and maximum operating temperature (538/1000 ºC/ºF) and the lowest temperature coefficient (0.02% per degree) of all permanent magnets, which makes them very stable against demagnetization over a wide range of temperature and only magnets to maintain useful magnetism when heated red-hot. Alnico magnets are classified using (1) numbers assigned by the Magnetic Materials Producers Association (e.g., Alnico 2, Alnico 5, Alnico 5-7 etc.) and (2) manufacturing method, cast or sintered. As a general rule, cast Alnico magnets, because of their anisotropic property, or can be magnetized only in one direction, have a higher magnetic strength (5.0-9.0 MGOe) than sintered Alnico magnets (1.5-5.3 MGOe) of equivalent grade, some of which are isotropic, or can be magnetized in any direction. Among various grades of Alnico magnets, cast Alnico 5 is the most widely used Alnico magnet. Most Alnico magnets are manufactured using foundry casting techniques, where the molten alloy is poured into sand molds. Thus, these magnets can be cast in complex shapes (e.g. horseshoes) not possible with other magnet materials. 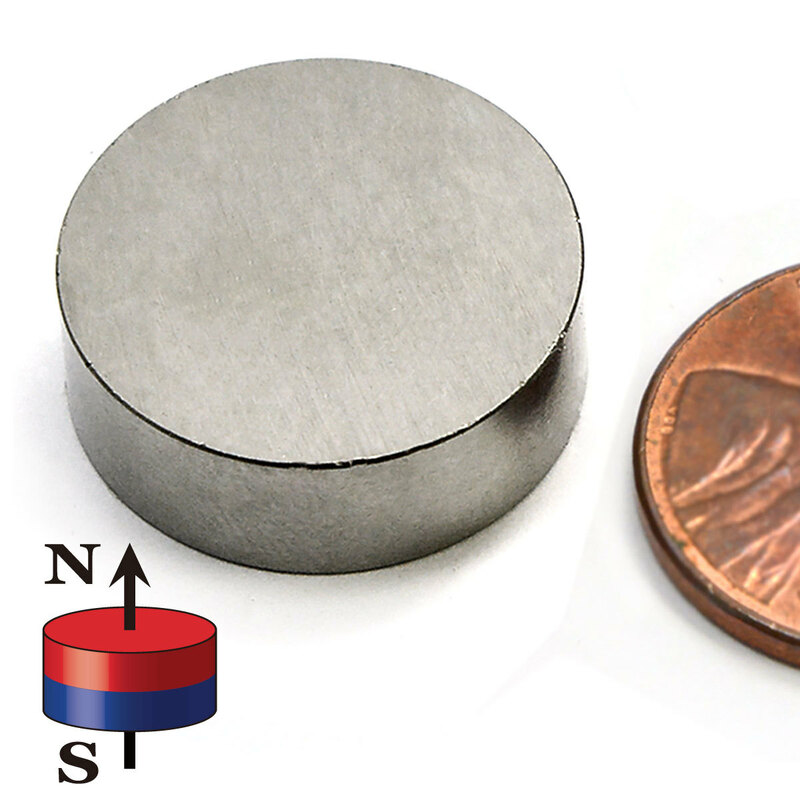 Very small magnets, usually one ounce or less, are produced using sintering techniques. Alnico magnets are hard and brittle, and not suitable for drilling, tapping, or conventional machining operations. Thus, for mechanical-stress protection and cost consideration, use of cast or sintered Alnico magnets in simple shapes and not too small cross-sectional area (> .125") are recommended. For further protection in cases of high mechanical stress such as holding and rotors, the Alnico magnets can be housed in an aluminum housing. Also, when handling these strong and brittle magnets, proper handling and packing procedures are required to ensure safety. Alnico magnets are highly resistant to corrosion. As such, they are typically used in various applications with no coating or plating. In the past, Alnico magnets are superseded by rare-earth magnets, whose stronger magnetic fields allow smaller-size magnets to be used for a given application. Because of increasing shortage of rare earth supply, an intensive search for alternative permanent magnets are under way. 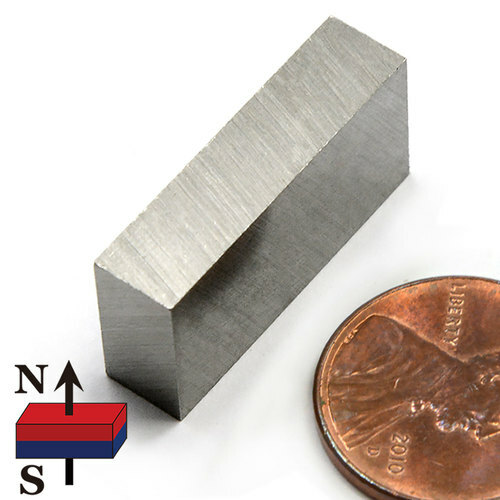 Alnico magnets, because of their stable temperature characteristics, have shown great potential for replacing Neodymium magnets for applications above 200 ºC. The Alnico magnet market is projected to grow by ~9.6% in terms of revenue by 2022 due to the innovation efforts to advance increasing number of applications among many industrial sectors such as automobiles, medical devices, household equipment, etc. Environmental protection has also stimulated the use of non-rare-earth Alnico magnets.